After several months of beta testing, Yahoo messenger 9 is now available for download. The default installer from Yahoo’s official website is an online installer, and you need an internet connection to download the remaining files. If you are shifting or formatting your PC, then you would need to download Yahoo messenger again. To avoid this, here I am providing you a link to download Yahoo messenger 9 offline installer. Share and upload photos to Flickr. Option to view maps and videos inside Yahoo messenger window. More support added for local languages. Brand new skins and emotions. Improved PC to PC call. You can add and check status of your MSN Live messenger contacts in Yahoo messenger. Yahoo Ping box (I like this one!! ): If you are a webmaster its worth to give a try for this cool widget to add chat box in Blogger or any website . If you are online, YM9 can forward messages sent by your YM buddies to your phone via SMS( I think that would cost a few bucks). If you are offline on Yahoo messenger and if someone left you a voice message, you can now choose to forward it to your email. Click Contacts in the Messenger main menu and select Call History. At the bottom of the window that opens, click to activate voice mail service by producing your email. 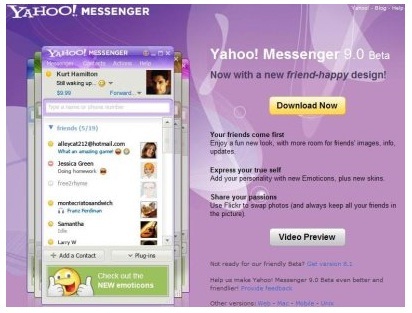 The major disadvantage of Yahoo messenger 9 is that it’s an ad supported instant messaging client. The other factor is its large size ( Apprx. 15 mb) and memory usage compared to close competitors. So instead of using Yahoo messenger, I usually use mobile Instant messengers like Talkonaut, which supports Yahoo, MSN and Google talk together. Update: Yahoo Messenger 10 released. Download the full installer here . it’s good to have off line download as its very much help me to install to my system and do appriceate for the convineace have made to get huzzle free back up.